Great Future for this Producer bred by the Gentleman Breeder Joe Valentine. We sold her beautiful Dam "PC Miss Dixie Classic" to Red McCombs for $11,250 at the 2011 Midwest Sale, She goes back to the "Jaynie 698" Cow that has given an awesome line of production to "Joe Valentine and Bill Hudson"". "Helm Dixie Chic" has given us two beautiful heifers by two different Sires. 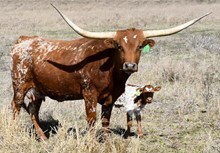 She is currently bred to "Hubbells 20 Gauge" for a 2015 Spring Calf. Check out her progeny tab below and follow her future offspring. 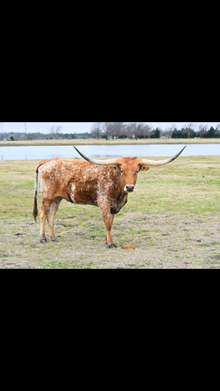 She has a ton of twisty horn, she is feminine, she is correct and she produces the same along with spectacular color and conformation. She is a good One !